Elvenguard began as a salute to two of our friends and their relationship. Tea-Ra and Spoonie Doolittle started as voices heard on Twitter, and became treasured friends. When their anniversary came up, I was saddened that we hadn’t known them when their relationship began. 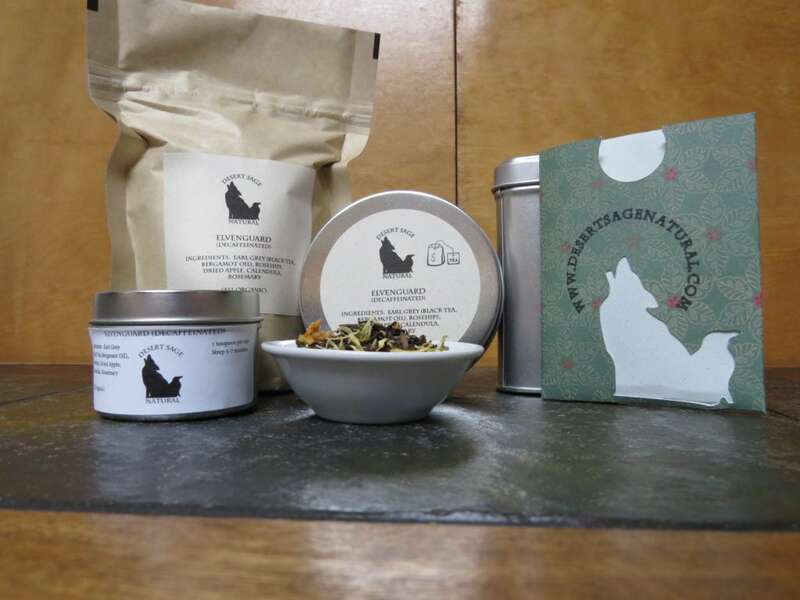 I have developed a habit of creating teas to celebrate the ceremonies that join our friends together. The process of creation brings me joy, and the end results have seemed to do so for the humans they are made for. I decided that, even though the ceremony had happened, I could still make a tea commemorating them and their relationship. In this particular case I decided to try a different method than I had utilized prior. Instead of working merely from known preferences, I decided to delve into the meaning of plants from legend and lore – choosing components that I thought suited them, both individually, and as a pairing. However, when the time for the taste test came, I was tripped up by a fact I hadn’t known. Spoonie Doolittle has a fairly intense sensitivity to rosemary. As a flavour, not as an allergy. But while they both liked the combination of flavours, it wasn’t something they both would be able to drink with the regularity I would want for this kind of tea. However, while it was not suitable to be their tea, it was a wonderful flavour set in its own right. Which meant, of course, that we wanted to keep it. It was hard for me to approach a name for the tea once it had been repurposed. The sense of it was steeped in the quest for creating a flavour out of meaning – but it needed a new direction – in part, to clear the boards for next attempt at creating a tea for our two friends. I didn’t manage to spark a proper tea naming thread in the public spaces of the Twitterverse, but one of my other habits bore unexpected results. 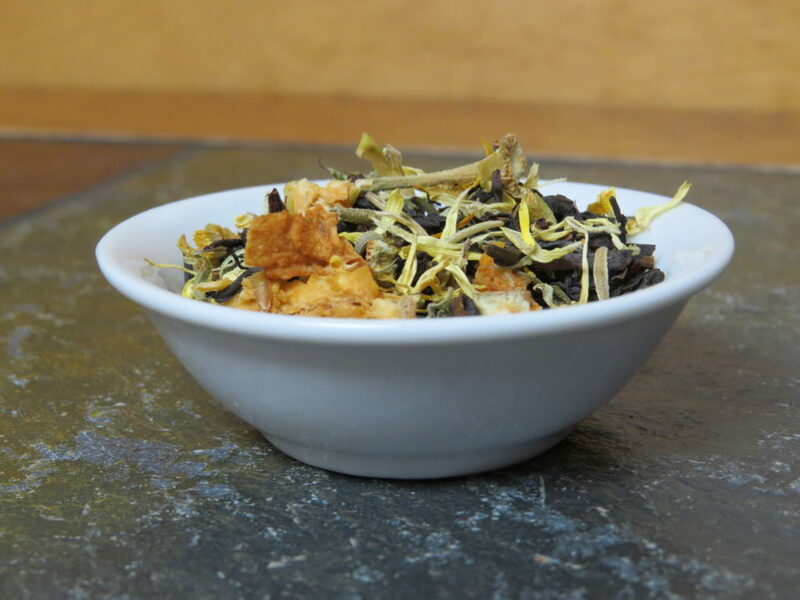 Knowing that one of our orders was heading out to someone who had a particular love of Earl Grey, and was someone who was adventurous enough to not find rosemary to be an automatic nope, I sent a sample of this tea out into the world, looking for feedback, and perhaps for ideas on a name. She’d done a bit of research, and discovered that many of the ingredients in this particular tea were mythologically attached to the fae – classically, and in both Nordic and Gaelic stories. The rosemary to defend against them, the calendula to see them, and the apples for eternal youth. Batch Size: 2.8 oz (approximately 79 grams), making at least 30 servings of tea. I did decide not to use garlic. It was tempting, given its association with protection, strength, and healing, but… maybe if I start making soup blends. Sadly, on a long pause right now, as there is an ingredient I want to test out for potential use in it that is proving difficult to acquire. This is one of the reasons why I love it when people fill out our survey. I am always a bit hesitant to include something when I do not have proper data. I begin to believe that for any substance that can be consumed, there is at least one person out there that is allergic to it, and I would never want to send a smidgen of death to anyone. I love learning things. I love being given shiny nuggets of information to add to the random trove in my brain. It makes me happy. Interestingly enough, she also drank the tea while dealing with some fairly terrible chest congestion, and found it quite helpful. This entry was posted in Black Tea, Citrus, Floral, Fruit, Simply Tasty Teas and tagged Decaffeinated Black Tea, Decaffeinated Tea, Desert Sage Natural, Fantasy Tea, Fruit Tea, Organic Calendula, Organic Dried Apples, Organic Earl Grey, Organic Fruit Tea, Organic Rosehips, Organic Rosemary, posts with audio by DesertSage. Bookmark the permalink.